This year, things are heating up at Greek Theatre as coming LIVE to the California venue is the sensational James Bay! With his chart topping anthems such as "Hold Back The River" this singer, songwriter is one that cannot be missed. Back on the road after his major successful year in 2016, James Bay will grace the stage, live on Thursday 11th October 2018! Make your year a memorable one with concerts that will stay in your heart forever… just like this one! James Bay is one of the biggest artists on the modern songwriting scene, known for his incredible releases that have rocketed straight to the number one position, not just in the UK but also number 15 in the US charts! It was clear from the get go that this guy would be sticking around… Chaos and the Calm his debut album was released back in 2015 and hit the big time and has had him touring ever since. 2018 marks another exciting time for the solo artist as he travels to the US for another amazing year on the touring circuit. "In pop star land, James Bay has the whole package – the chiselled cheekbones, trademark fedora – even Burberry have styled him up as their celebrity endorser of choice. 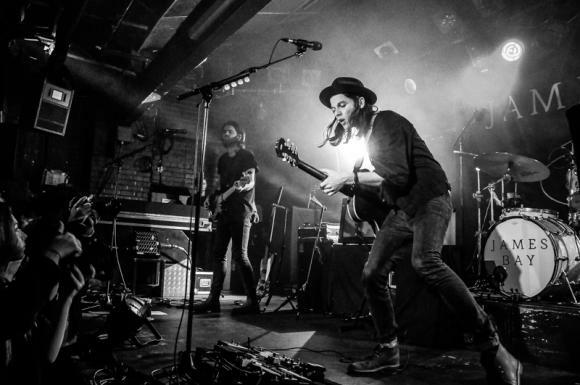 After being discovered via YouTube, undergoing a Cinderella rags to riches story, James Bay has undoubtedly morphed into a national treasure." "A year ago today, because of you guys, my album went to number one, Bay exclaims to the crowd. Tonight his set is filled with over an hour of album tracks taken from ‘Chaos and The Calm’ and a few more surprises. Every word the singer utters in-between tracks the room fills with deafening screams and outbursts of “I love you James” that show just how much adoration his fans have for him."